Well, they’re not much to look at, but in the “quietly carrying on while everything drops dead around you” department, the lungfishes are tops. These large, eel-looking creatures are what biologists refer to as “living fossils”, species which have existed in more or less their present form for a very, very long time. 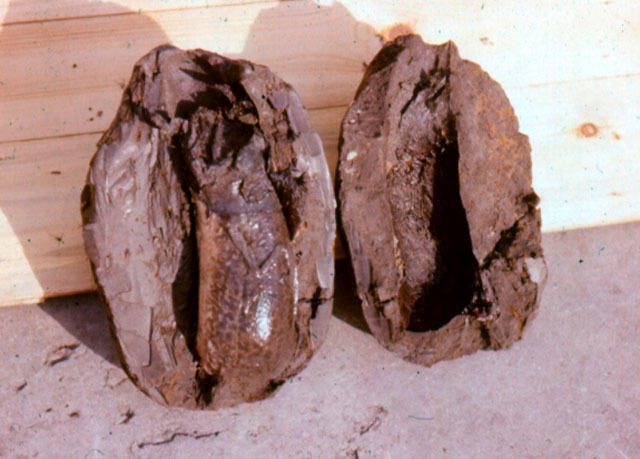 In the case of the lungfishes, around 400 million years. For the sake of comparison, this was around the same period that plants developed roots and leaves. That long ago. In fact, researchers believe that the lungfishes are the closest living relatives of the terrestrial vertebrates (that is, anything with a spinal column that lives on land). These will probably outlast humanity. So what makes these things so interesting, besides being old? First off, they breathe air, as you might have guessed from their name. Australian lungfishes have a single lung, and, while they normally breathe through their gills, are able to supplement their oxygen intake with air during times of high exertion or when their water gets stale (Fun side note: During mating, Australian lungfishes make loud burping noises at the surface of the water which are thought to be part of the courtship ritual. I’ll refrain from making any Aussie jokes here… ). 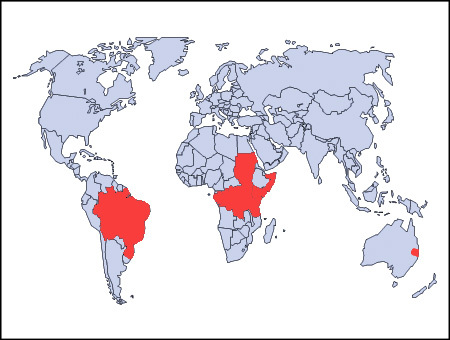 African and South American lungfishes, on the other hand, have two lungs and breathe nothing but air. Their gills are completely atrophied, such that they could actually drown if kept under for much longer than their usual 5-8 minutes between breaths. This ability to breathe without water results in the other fantastic ability of subclass Dipnoi. 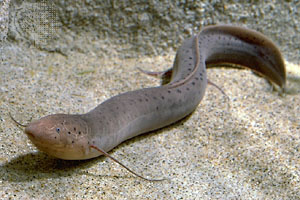 South American and African lungfish live in habitats which often dry up completely during the hottest part of the year. The fishes’ gross but brilliant answer to this is to burrow up to half a metre down into the soft mud and excrete a huge amount of mucous. As the surrounding mud dries up, the mucous forms a hard shell which keeps the curled up lungfish moist and cool. A small hole at the top of this snot-cocoon allows the fish to breathe. It’s metabolism slowed to only a small fraction of the normal rate, the creature will aestivate (like ‘hibernate’, but without the cold) like this for several months until the rains return. 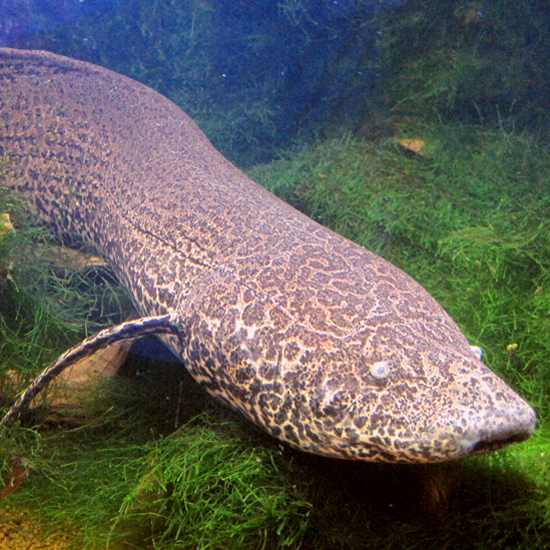 Laboratory experiments have shown that an African lungfish can remain alive under these conditions for as long as six years. Aside from their amazing survival abilities, these fish have unusual lives, as fish go. They are extraordinarily long-lived. 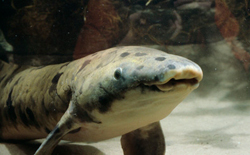 The Shedd Aquarium in Chicago holds an Australian lungfish known as “Granddad” which arrived there as an adult in 1933, making him at least 80 years old. Females of this species don’t even mate until they’re at least 22 years old (or so they tell their parents). What’s more, some species actually care for their young. The mother and father build an underwater nest for their offspring, which can only breathe via their semi-atrophied gills for the first seven weeks, and the father uses his body to release additional oxygen into the surrounding water, helping them to breathe. So, dual childcare: not such a new idea after all.